Our Solar System as we know it today formed out of a primordial disk of gas and dust called the Solar Nebula. Models of the solar nebula try to understand how the gas and dust in this primordial environment coalesced into the planets we see today. One important first step is understanding the process of water ice formation. One of the outstanding questions is whether water molecules formed crystalline or amorphous ice. If it was amorphous ice, that would explain the high values of noble gases and volatiles in comets and in Jupiter’s atmosphere because amorphous water ice can trap these gases (note: volatiles are elements and molecules with low boiling points, so they stay in the gas phases and don’t condense out unless temperatures are very low). However, the typical picture of water ice formation in the early solar nebula favors crystalline water ice. This is because the ratio of deuterium to hydrogen (D/H ratio) is low in the solar system compared to the surrounding Interstellar Medium and lowering that ratio requires high temperatures (>500 K). Thus, the water ice is thought to form when a clump of gas close to the star migrates outwards and cools. The water ice is expected to condense out at temperatures of ~120-180 K. This is too high for amorphous ice to form, so the ice is more likely to have a crystalline form. In this paper, Ciesla demonstrates that amorphous water ice is easier to form than previously thought, which could explain the amounts of noble gases in comets and Jupiter’s atmosphere. Water ice is formed as gas cools and water vapor freezes out onto the surface of a nearby grain, which we call the substrate. One of the deciding factors of whether or not water ice forms in crystalline or amorphous structure is how the water molecules move on the surface of the substrate. Crystals form when the rate of water molecules landing on the surface (the flux) is low, because this gives the molecules time to “arrange themselves” into a crystalline structure before freezing. If the flux high, then the process happens too quickly for the water molecules to form an ordered crystalline structure and amorphous ice is formed. The boundary between high and low flux is called the critical flux, Fc, and it depends on the smoothness of the substrate surface and on the temperature. 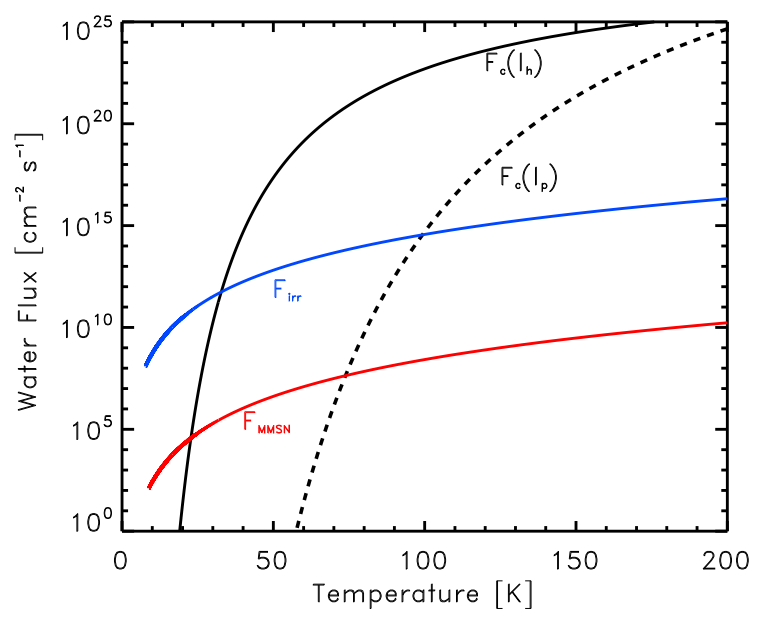 The black lines in Figure 1 show how the critical flux Fc depends on temperature for water ice condensing onto two different crystalline surfaces, hexagonally crystalline water ice (solid line) and cubic crystalline water ice (dashed line). Shown for comparison two different models of flux in the mid-plane of a solar nebula with high or low initial densities (blue and red lines respectively). For a cubic crystalline surface, amorphous water ice can form at temperatures as high as 70-90 K depending on the solar nebula model. Figure 1 from Ciesla (2014) – The black lines show the critical flux for the formation of amorphous water ice on a hexagonal crystalline surface (solid line) and a cubic crystalline surface (dashed line). For comparison are two models for the flux at the mid-plane of the solar nebula (red and blue). If the model flux is higher than the critical flux, then amorphous water ice can form. Models of the solar nebula have ice forming at 120-180 K; these temperatures are still too high to form amorphous ice even accounting for cubic crystalline surfaces. However, cold water vapor has recently been seen in TW Hydrae, a protoplanetary disk around a nearby star that is an analog to the early solar nebula (for more about TW Hyrdrae, see this astrobite). The water vapor was detected far from the star, where the temperatures are very low (< 50 K). This water vapor comes from ice on the surface of grains being photodesorbed by ultraviolet (UV) photons (evaporation of ice to vapor through the absorption of a high energy photon). This vapor would then quickly freeze out again, but this time at the local temperature (< 50 K), which Ciesla showed is low enough for amorphous ice to form. The high amounts of noble gases and volatiles in comets and Jupiter have been a problem in the models of ice formation in the solar nebula. These gases are trapped by amorphous water ice, but models show water ice forms at temperatures of 120-180 K, too high for the formation of amorphous ice. 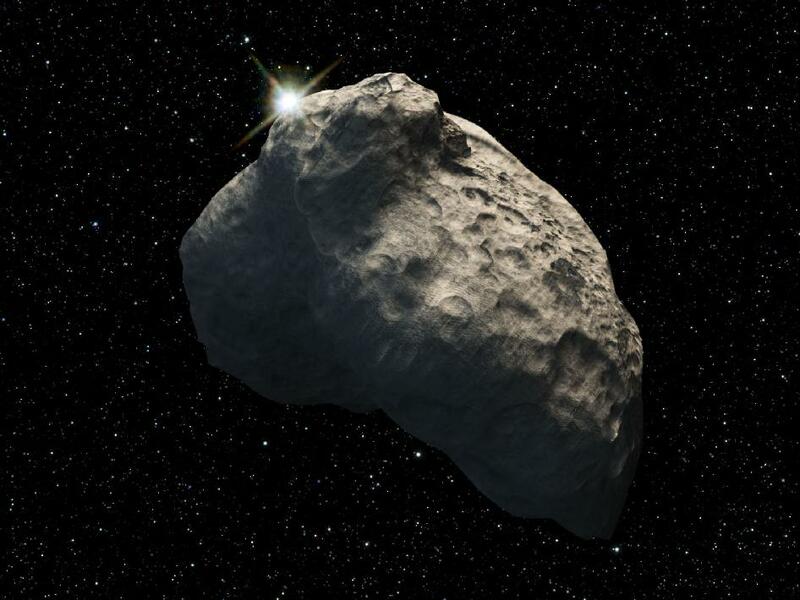 Now Ciesla has shown that crystalline water ice that is photodesorbed by UV photons can reform as amorphous water ice in the cold outer regions of the solar nebula. This process can produce enough amorphous water ice to trap volatiles and noble gases to explain the volatile-rich atmosphere of Jupiter. 14 New Kuiper Belt Objects in the Southern Sky AU Mic through new ALMA glasses Can Icelines Explain Uranus and Neptune? Chondrule formation by shocks?